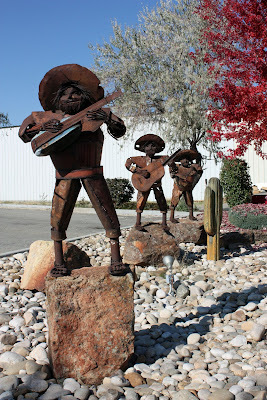 A recycled metal mariachi band - with speakers playing music to match. Notice the wood saguaro, too. These band members can be found in the parking lot behind a Mexican restaurant. I like they did the whole band, pretty neat. The trees looks nice too. I've seen a statue very similar to this at the Cactus Car Wash in Montrose, CO. I wonder if they had the same creator, they look so much alike. I haven't seen these before! Which restaurant is this? In the WWV there is a car repair shop called Melody Muffler and they had a band made of recycled car parts. The collection has grown to include a football player, a woman, and even a guy on the toilet! It's great! I'll post a photo one of these days. What a great 'metal band'! My favorite kind -- silent!